Is Great Entertainment for all ages and music tastes. Siddy Sounds is a Top Quality Mobile Disco for any occasion including Weddings, Birthdays, School Discos, Children's Parties, Student Party Nights - large or small. Siddy has been offering Great Disco entertainment for many years now and he is frequently asked to travel many miles to make that party night a SPECIAL night, Siddy gives a professional service covering mainly the Midlands yet London, Lake District and Wales are frequent locations. He has both Large and Small lighting and sound systems available for any event including Corporate Entertainment, Proms, Balls, Promotions, Fashion Shows, also stage lighting to give atmosphere to Outdoor Garden Parties. The use of intelligent lighting and projection of images makes Siddy Sounds mobile disco one of the best around. Siddy just gives great value party fun. A quality Mobile Disco that can make your Wedding even more SPECIAL. For most Weddings the longest section is the evening - One of the most popular functions for this last part of the day is the mobile disco - since it is practical and can be the most cost effective form of entertainment because a mobile disco will normally carry a wide range of music to suit most ages and tastes. This is an area that Siddy Sounds mobile disco excels, having a large show using quality sound and lights with access to about 10,000 tracks he can give your wedding sparkle and make it a night to remember. If Siddy does your wedding photography then evening guests can see your wedding photgraphs as part of the evening show as well! The school disco sets a standard, it’s the first disco for many people and it’s at a time when fun comes first! Forget hang-ups about is the music cool you want to be seen dancing moving and shaking your body getting hot. 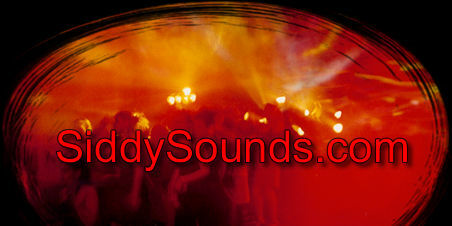 So fast fun music with dance moves that lets you dance with your mates is what you need – party music! So when a school wants a disco its wants it to be great – its needs the bigger mobile disco and a DJ that wants the kids to have fun! Who would want to teach a class full of unhappy students the next day after a poor disco? – nobody! Siddy has been regularly doing disco’s for schools ( first, middle and high ) for many years giving them a big show that the students will remember. Which is why he does so many university balls ( eg Oxford and Cambridge colleges ) again the students want a big night to remember so Siddy is the safe bet. Now every week many adults dress up in ties, white socks and pleated shirts going to a school disco themed night. So who better to do a nostalgic school disco that Siddy who probably has done a real one only a week or two ago! Adding extra 80’s & 90's music that has past the test of time and become classic disco music usually brings back all those happy memories! So don’t forget if you want a Classic School Disco - Siddysounds Mobile Disco is a great place to start.